Documents of the former "National People's Army" (NVA) of the "GDR" from the 1980s refer to a "Kleekamp Highway Strip", i.e. a section of the autobahn that is prepared for the use by aircraft. Directly at Kleekamp there is no autobahn today, but plans at that time envisaged the course of the Wismar-Schwein autobahn here. Directly northwest of Kleekamp there should have been a straight section of road about 4 km long, so that it can be assumed that the highway strip was planned in this area. After reunification, the highway now known as the A 14, was built approx. 3 km to the east. 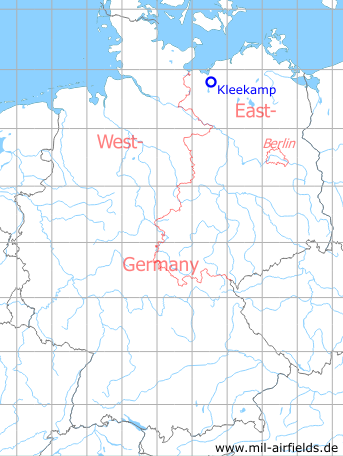 Kleekamp is located approx. 12 km southeast of Wismar and 6 km northeast of Bad Kleinen. The telecommunication connection should have taken place via the Funktechnisches Bataillon 43 (FuTB-43) Parchim-Dargelütz.